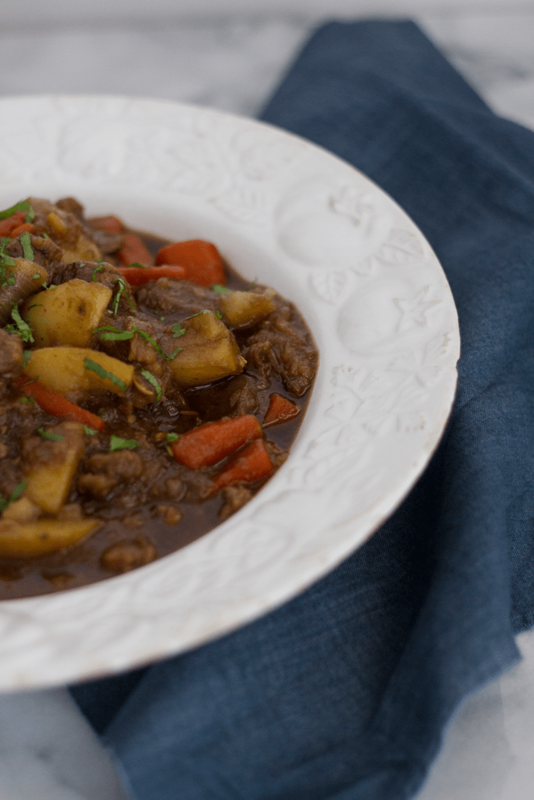 Guinness Beef Stew - perfect for St. Patrick's Day! 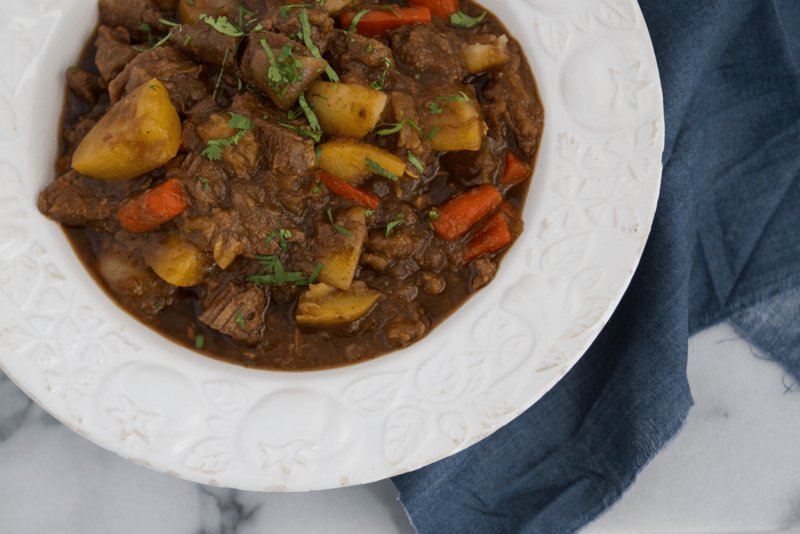 In preparation not only of St. Patrick’s Day, but the last two months of real winter in New England, I am sharing a recipe for the most tender, most flavorful Guinness Beef Stew you’ve ever tasted. There’s something so comforting about beef stew. The way the tender beef melts in your mouth and the root vegetables just add the perfect balance of textures. The earthy, meat-rich sauce and the hint of a stout beer. It’s one of life’s greatest pleasures, specially in the middle of the winter. One think that takes this recipe over the top is the addition of 1/4 cup demi-glace. At the restaurant I work at during the summer and fall, we make huge batches of demi-glace for our dishes and always end up having a ton leftover that we freeze in small 1/4 cup portions. Normally, home cooks don’t make their own demi-glace (basically simmering down roasted veal bones until a rich, collagen packed sauce results). You can buy it already prepared at gourmet shops or city grocery stores as well as order it online. It’s worth having some in the freezer for recipes like this that benefit for that added richness. Simmer this recipe starting in the afternoon around 3pm and by dinner time you will have the most delicious beef stew you’ve ever tasted. Note in the ingredients I’ve included traditional Guinness Beer but you can use any porter or stout beed you’d prefer. Not into beer? Coffee works great in this recipe as well! In a large pot, heat olive oil and add the meat. Sear on all sides for about 6-8 minutes. Add carrots, parsnips, onions, garlic, beer, soy sauce, stock, and demi-glace. Simmer over medium heat for 2 hours, covered. While stew cooks, in a separate pot with boiling water, cook the potatoes until tender. Cooking them separately will assure they don't turn to mush in the stew. After two hours, uncover the stew, add the potatoes, and increase heat to medium high for 30-45 more minutes, stirring until everything comes together. Serve immediately with herbs on top.